Should Japanese People be Enjoying Our Opening Day? Jobu weighs in on Major League Baseball’s traditional Opening Day in Japan. I’ll first start out by saying that I have no problem with the Japanese. They are, in fact, one of my favorite people. Just look at this video! How can you not love them? But, no matter how much I love the Japanese culture and people, I really can’t support Major League Baseball kicking off our season in Japan, or any other foreign country for that matter. 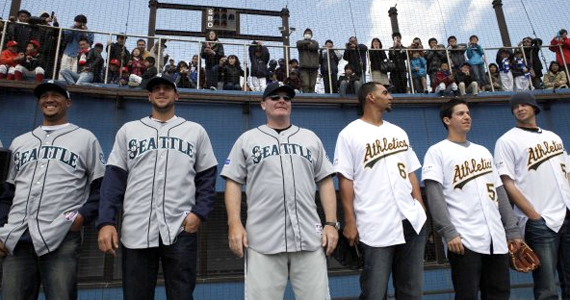 Today, MLB kicked off in Japan, as the Oakland Athletics played against the Seattle Mariners in Tokyo this morning (Mariners won 3-1). Why do I have a problem with this? Baseball is known as the American pastime. Opening day is one of the most anticipated days of the year, right? Is it really fair to have that day, which true fans like myself really look forward to, in a place with a fourteen hour time difference (seventeen for those on the west coast where the A’s and M’s play)? Even before you consider the time difference, consider the fact that the first two games of the season are being played almost a week and a half before any other game is played. The Yankees, for example, don’t start until Friday, April 6th. I’m assuming the week long layoff is so that the players can come home and adjust to the that seventeen hour time difference, but still, it seems a little ridiculous to play baseball, then have none for all that time. The A’s and Mariners even play exhibition games in between their second and third games. Ok, now back to the whole seventeen hour time difference thing. The first game of the Japan opening series started at 2:10 AM West Coast time this morning. In fact, it’s been over for almost two hours now, as I am writing on the East Coast. Who the hell gets up at 5:10 AM, let alone 2:10 AM to watch baseball? Probably not too many people, as even the most die-hard fans probably have work in the morning. Sure, MLB network will be showing the game on delay later on, but watching a game you already know the score of is not nearly as fun. Look, I understand that one of the main goals of Bud Selig and the MLB is to expand across the globe. I believe that’s a smart decision. Not only will it expand revenue from merchandising and the like, but it will lead to an improved talent pool as well. There are already hundreds of international players in the game, and although infusing the league with more international talent might push American players to pursue other sports instead (because of lack of opportunity), international talent pools will help teams put better and better teams on the field at all times. This will make the sport better and keep fans coming back again and again. Furthermore, foreign fan bases love rooting for their own in American sports. It’s why Manny Pacquiao is in movies, makes records and is also a congressman in his native Philippines. It’s part of why Linsanity happened in New York this winter. I mean, I’ll tell you right now if there was a Uruguayan player in the MLB, I’d have all his jerseys and would watch all his games (according to my third grade yearbook, that was supposed to be me… sigh). International expansion is the future. It will bring countless dollars into American sports leagues, and we should embrace and promote it. So I get that. Believe me. I just don’t think giving up opening day is the proper way to promote this. Number one, it takes players a long time to recover from the time change and travel. As I said, that’s probably why the Japan games are about a week-and-a-half before the season starts for everyone else, but is that enough? They still play exhibition games when they get back, which is slightly ridiculous. How can you play exhibition games when the season already started? 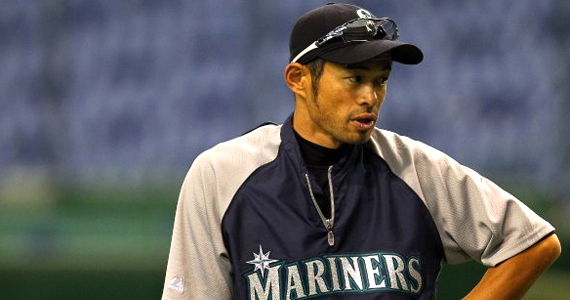 If the A’s or Mariners are 0-2 when they come home from Japan, are they going to want to play meaningless games? No. Not at all. They’re going to want to rest so that they can make up the games they lost as quickly as possible. 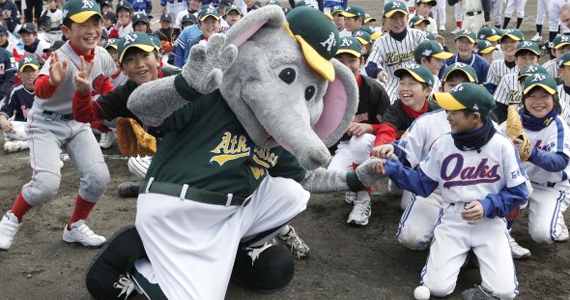 I think the best ways to promote baseball around the world is to send “barnstorming” teams out to Japan during the offseason to play exhibition games. I know, it’s not the same as old timey barnstorming, but each offseason MLB sends teams of representatives to countries to which the league is looking to expand. This offseason, they sent a group of players to China. To me, that’s perfect. It doesn’t affect the season at all, and is just as effective at spreading the MLB gospel. After these trips, players still have a couple of months to adjust to being back in America, and still have plenty of time to get physically ready for the season. If you want a good example of how to expand internationally in the most effective way, look at the NBA. David Stern has helped build what is basically an international league that is played in America, and I’ve never seen a regular season game played in Timbuktu. Still players now come from all over Europe, South America and Asia to play in the NBA, and the NBA brand is one of the biggest in the world. There’s no need to give away crucial regular season games for promotion of the sport. I mean, if we’re giving away opening day, how long before a playoff round, or even World Series is played in a foreign country (and no, Canada doesn’t count)? As I said earlier, I wish nothing but the best for people from Japan. They have done an amazing job turning their league into the second most competitive in the world. Their fan bases are probably the most passionate in the world too, and it is one of my secret dreams to one day watch a baseball game in Japan. I just don’t want it to be Opening Day of the Major League Baseball season. Hopefully we can one day say “sayonara” to that tradition.